On May 10, 1982, the British frigate “Alacrity” attacked the merchant ship “Island of the States”. There were 25 dead and two survivors: a Spanish sailor and a corvette captain. The story of a long night in icy waters and six days on an island. A luminous flare launched at two hundred meters high broke the darkness of the narrow San Carlos on the night of May 10, 1982. The boat, 80 meters long, with twenty-five crew members on board, was uncovered. The answer did not clear his doubt: they had not thrown it. Two minutes later the ship “Island of the States” began to receive mortar impacts on starboard. A blaze of fire rose over the ship. From the enemy position, they assumed that it was an oil tanker. From the bridge, Payarola again communicated with the “Forrest”. He asked for “ceasefire” and warned the coastal batteries to stop shooting. Payarola saw that almost everything around him had disappeared. He decided to leave the bridge and walk to the port. He saw Captain Tulio Panigadi, commander overseas, lying on the ground. He heard screams of pain, voices that emerged from the water. Another explosion opened a tongue of fire on the fuel drums. The ship was rocking sideways. Payarola had on a pullover, a scuba, and a pair of campaign boots. He heard noise from approaching helicopters. At that moment he understood that he had been hit by enemy forces. He threw himself into the icy water of the strait. A few minutes later the ship Islas de Los Estados disappeared from the radar screen of the frigate HSM Alacrity. The “Island of the States” had been armed in Spain in 1975. Five years later it was incorporated into the Navy as a transport vessel. It was a merchant marine vessel, which sailed with a civilian crew. It was useful for the transport of sheep, merchandise and people between the territory and the islands, in compliance with the cooperation agreements between Argentina and England signed at the beginning of the seventies. On March 28, 1982, in Puerto Deseado, Santa Cruz, the “Island of the States” began to load weapons, vehicles. There were soldiers in uniform at the dock. The civilians of the merchant marine were surprised. Alois Payarola assumed the military leadership of the ship. Offshore reported the mission. The “Island of the State” would join “Operation Rosario” as part of the Task Force that would take the Malvinas Islands. The novelty surprised the civil crew. Some of them were foreigners. The “Island of the States” was the first merchant marine vessel that arrived in Puerto Argentino. The Army used it for the transfer of cargoes of other merchant ships that by their tonnage could not moor in the small wooden pier of the capital of the island. He also transported supplies, fuel, weapons and ammunition and troops to different positions of the Argentine troops. The ship did not have an anti-aircraft defence. He sailed at night, in the fog, and tried to hide in geographical accidents so that his position would not be exposed. From the “Island of the States”, through a crane, 25 mines of 400 kilos of explosives were placed in front of the waters of Puerto Argentino. On May 1, 1982, after the British air and naval bombardment of the capital of the islands, it was decided to move the ship to the San Carlos strait, which separates Soledad Island from the Great Malvina. In this new position, the “Island of the States” continued loading and unloading with other ships. One of them was the “Monsunen”, a small ship confiscated from the Falklands Islands Company (FIC), which used to be used to transport sheep. The “Monsunen” sailed from Puerto Argentino to the San Carlos strait in search of fuel and ammunition. Under his charge was the then-Major Jorge Monge, Operations Officer of the Air Defense Artillery Group 101 (GADA 101). “Our war materiel was on the ship” Rio Carcarañá “who had also moved to close San Carlos Monge declares in an interview with the author of this article. On May 2, we began to skirt the island Soledad south. Then I got an “underwater alert. “ The cruiser “Manuel Belgrano” had sunk, and they warn me that we could also be attacked. To maintain the morale of the troop, I did not mention it. The first thing I thought was the casualties. Be careful, but what alert could I take if I had an automatic rifle, two machine guns, a raft, and two or three lifeguards? 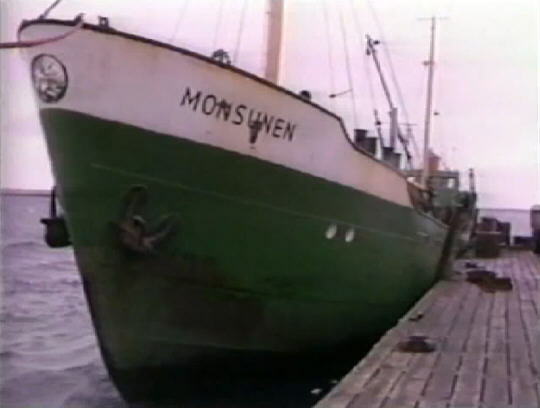 The “Monsunem” was a flimsy little boat. – How was the contact with the “Island of the States”? -It will be May 4th or 5th. There I met Captain Marcelo Novoa. I knew him by courses at the Military College; We were also in Jujuy when the troops mobilized for the conflict with Chile. He was an artilleryman, I was a mountaineer. In the San Carlos strait, we unloaded the material for my unit: cannons, part of the 16 thousand shots of ammunition and also gave me the order to remove fuel for radars and helicopters. They were 200-litre barrels that we put on the deck. If they hit us, it exploited everything. – Did you suspect that they could be shot? -After the “Belgrano” the possibility of a submarine was latent, but the depths of naval cartography could not get into the strait a submarine of bearing. But a frigate. And there were frigates everywhere. The island is an air defence. Requires aerial and ship superiority. And we on the island did not have boats or planes. The Argentine planes could only be a minute in the air and had to return because they were thrown into the sea. The Air Force left from Río Gallegos or Comodoro Rivadavia; there were no fighter planes on the islands. That’s why the frigates came and threw every night. We had 155mm guns that had range, but they were very few and did not have an observer to locate them well. It was difficult to impact them. – What was the internal climate of the crew in the “Island of the States”? It was a merchant marine vessel composed of civilians and some sailors. Novoa told me that the civilians had not been convinced to go to the Malvinas, and he told me that they – the military – were in a minority. The “Monsumen” started north of the strait to make another transfer with the “Carcaraña River”. On May 9, the fishing vessel “Narwal”, which was intelligence for Argentina, was intercepted, machine-gunned and sunk by two Sea Harrier planes. There was one dead and twelve injured. After desperate distress signals – “we have serious injuries”, “we left the ship with 25 men”, “we threw an orange boat into the water with the seriously wounded” – a Puma helicopter flew from Puerto Argentino to the south to rescue them. They were hit by a missile. Three pilots died. The wounded of the “Narwal” who were taken prisoner by the British Navy. Early the next morning, in a laborious transshipment, the “Carcaraña River” delivered a twenty-five-ton rocketship to the “Island of the States”. It was almost night when the tasks finished. Captain Panigadi decided to continue on the narrow San Carlos to Puerto Howard. I expected to arrive at dawn. There I would wait for new instructions. An hour later, at ten twenty in the evening, the radar operator of the English frigate HMS “Alacrity”, sailing in a south-north direction, heard an echo that alerted about the presence of a possible ship. From the frigate, they launched a luminous flare, which revealed its position, almost at the height of Swan Island. It was the “Island of the States”. At that time he had twenty-seven crew members, and he was transporting 300,000 litres of fuel, ammunition, bombs, which he stored in the hold, and the rocket ship. Captain Alois Payarola, from the bridge, communicated by radio with the merchant ship “Forrest”, moored in Port Howard. He asked if they had launched the flare. They answered no. A few seconds later, the projectiles began to impact on the starboard side of “Island of the States”. Part of the crew, who rested in the cabins, climbed onto the bridge, to find out what was happening. The captain kept the Motorola radio in his hand. The “Alacrity” continued its course through the strait, without stopping before the enemy ship, which burned down. Payarola came down from the bridge between the flames and the smoke. A final cannon impact had destroyed it. But he touched himself and felt that nothing had happened to him. There were bodies stretched between twisted sheets. A tongue of fire stood on the naphtha drums. The ship was tilting to starboard. It was drizzling. He found the sailor Alfonso Lopez, Spanish, and the waiter Hector Sandoval, 52, trying to launch an inflatable raft into the icy water. He urged them to save themselves. Lopez, who could not swim, fell in the centre. In his jump, Sandoval hit with a metal structure and did not come back to the surface. Without wanting to, Payarola slipped and fell into the water. He had a small hand torch with which he was trying to ask for help. He swam to another raft occupied by two sailors, Manuel Oliveira and Antonio Cayo. They were sinking. But they gave him a privileged place to keep his boss afloat. Payarola refused and preferred to swim away. The sailors shouted: “Viva la Patria”, “Viva la Patria”. And they were lost in the darkness of the waters. The ship “Island of the States” was already sunk. Payarola heard the buzzing of the blades of a helicopter in the darkness of the night, which was flying over them. A “Sea King” had approached to verify the area of the disaster. He tried to swim as he could, but the current was dragging him. I no longer heard the voices of other castaways. He felt his feet and hands freeze. With his flashlight, in the distance, he lit a black bulge. He swam in that direction. The black bulk was the sailor Lopez’s raft. Captain Panigadi and First Officer Jorge Bottaro, who escaped the explosion of the bridge, had also joined. They helped him up. The “Alacrity”, meanwhile, continued its navigation through the strait. It was the first British frigate that crossed it from south to north, on a reconnaissance mission. At that point of the war, England had already blocked the islands with the imposition of a zone of total exclusion. The “Carcarañá River” had been the last Argentine ship to reach the islands. England had also decided that the San Carlos strait would be the beachhead, but Admiral John Woodward wanted to make sure that the waters were not mined and there were no coastal defences that would jeopardize the next landing of the British infantry. The mission of “Alacrity”, however, was under extreme risk that same morning, after having sunk the “Island of the States”. The submarine “San Luis”, placed at the mouth of the strait, placed it on its radar and prepared the information for the launching of SST-4 torpedoes. He decided to impact him with two. It was one-thirty on May 11. The first torpedo did not get out of the tube, and the second was cut the guide wire minutes after the launch. Two days later the submarine would return to Mar del Plata and would not fight again. That morning, with the inflatable raft, Panigadi, Lopez, Bottaro and Payarola continued rowing towards one of the coasts of the strait. They were the only four survivors of the crew. But the raft was damaged. Panigadi decided to return to the water to reduce the weight. He was clinging to the lifeline that surrounded her. They spent several hours paddling until they spotted a coastline. But the current prevented them from approaching. They were afraid that I would push them out to sea. Panigadi decided to swim. He confided that he could reach the coast, but the waters diverted him, he moved farther and farther away. He raised his hands, called for help. “Panigadi is leaving”, “Panigadi is leaving”, Lopez shouted, until they lost sight of him. They did not see him again. Payarola had already lost his energies. The oars could not break the course of the current. They did not advance. He decided to grab a long rope, fifty meters, to the raft, took it from the other end and began to swim, to drag it to the coast. He was already a few meters away when he heard again the cries of Lopez, who alerted him. Lopez did not know how to swim. I could only give notice. Payarola turned back and went to the rescue of Bottaro, who was motionless on the water. He managed to take it from the vest and keep it; it was moving towards the coast. Lopez was still on the raft. He was at risk that the run would take him. Not know what to do. Until driven by his captain, decided to jump into the water and swim. In a supreme effort, he came to stand between the gravel and the sand of the coast. Payarola estimated that it would be three in the morning. The rain, which had harassed them constantly since the shipwreck, was now intensifying. But all three were safe. Bottaro was frozen, lying on the floor. Did not talk. They put it to repair, in a more protected place. Immediately began to have spasms and contractions. He had a cardiac arrest. They tried to revive him. He died in the rain. I still did not know where they were. With the oars, they dug a well and they stayed still, trying to rest, but the cold and the rain increased. Payarola and Lopez had wet clothes, both had lost a booty and had a barefoot. After a while, they decided to go out and get help. They walked for about an hour among the stones. It had not yet dawned. In the distance, on a hill, they observed a house and next to it, a shed. They entered. It was empty. The clothes were removed and covered with a burlap bag and sheep’s wool. In the packs, Payarola found the inscription “Swan Island”, which allowed him to be located. They fell on two cots and fell asleep. The house had food and began to separate it by rations. They also found drinking water inside a tank. That same day they went to tour the island but found nothing. With their feet protected by sheep’s leather, each dawn they made the habit of approaching the cliffs where they had landed, next to Bottaro’s body, and sat waiting for a ship or helicopter to intercept them. At times they waved an orange cloth that had taken from the raft but did not get any results. After five days, on May 16, the “Forrest”, a small freighter that had been seized at the quay of the Governor of the Malvinas, appeared through the waters of the strait. They signalled to him. The freighter approached but they did not recognize them. They were covered with burlap cloth and looked disfigured. They asked them to identify themselves. They raised the body of Bottaro. The next day he was buried in an improvised wooden crate in a local cemetery, with military honours. The body of Captain Panigadi was located days later by the crew of the ship “Río Carcarañá”, who had left in search of survivors of the “Island of the States”. On May 16, the “Carcarañá River” would be machine-gunned by Sea Harrier planes, but it did not cause casualties. Its crew, who swam to the coast, were also picked up by the “Forrest”. Only some bodies of the “Island of the States” could be identified and buried in the Darwin cemetery of the Malvinas Islands. Colonel (re) Jorge Monge tries to start a process of searching and identifying the remains of Captain Marcelo Novoa and Corporal Roberto Busto, 18, from Villa María, Córdoba, who died in the attack on the merchant ship. One of his survivors, Alfonso Alfredo López, a native of Finisterre, La Coruña, died in September 2005.